Saving Texas Dance Halls, One Two-Step At A Time Texas was once home to an estimated 1,000 dance halls — a legacy of the European immigrants who poured into the state in the 19th century. Half of the halls are now gone, and many that remain are moldering away. Enthusiasts say the best way to save the halls is to dance in one. Dance halls throughout Central Texas have been dying off from decay and disuse. The best way to save them? "Dance in them," says Patrick Sparks, a structural engineer and president of Texas Dance Hall Preservation Inc.
"My view is that the dance halls are the most Texas thing there is," Sparks says. "You get a look back at 19th-century Texas and the European immigrants that came and formed such a strong part of our character." This is what Sengelmann Hall looked like in 1915. Sparks offers technical expertise for those who want to renovate dance halls. 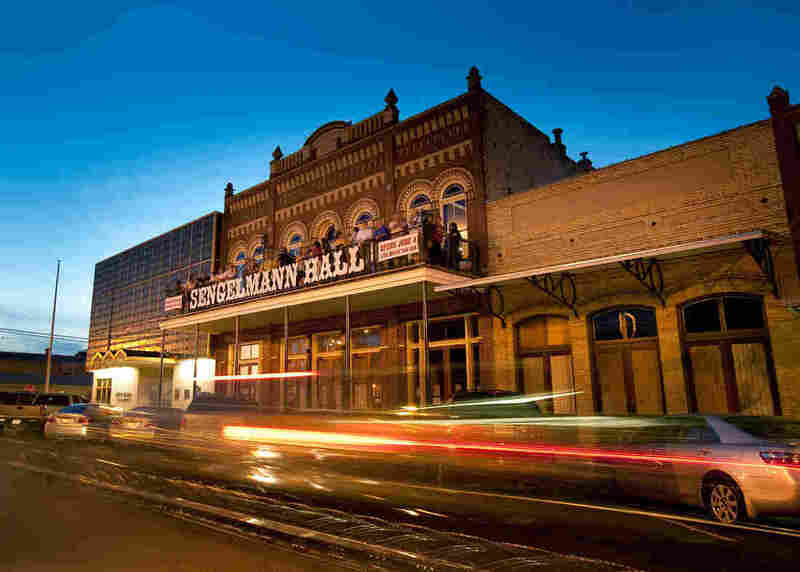 The newest crown jewel of dance hall restoration is Sengelmann Hall in Schulenburg, midway between Houston and San Antonio. It reopened this past summer after a two-year restoration. It features the original longleaf pine dance floor, cast-iron Corinthian columns, a mahogany bar and 10-foot-tall front doors. Sengelmann was built by German settlers in 1894, then closed during World War II. It hadn't been danced in for more than 60 years when Dana Harper bought it about 11 years ago. Harper is a Houston-based artist and scion of a Texas oil fortune — which is how he could afford the million-dollar restoration. 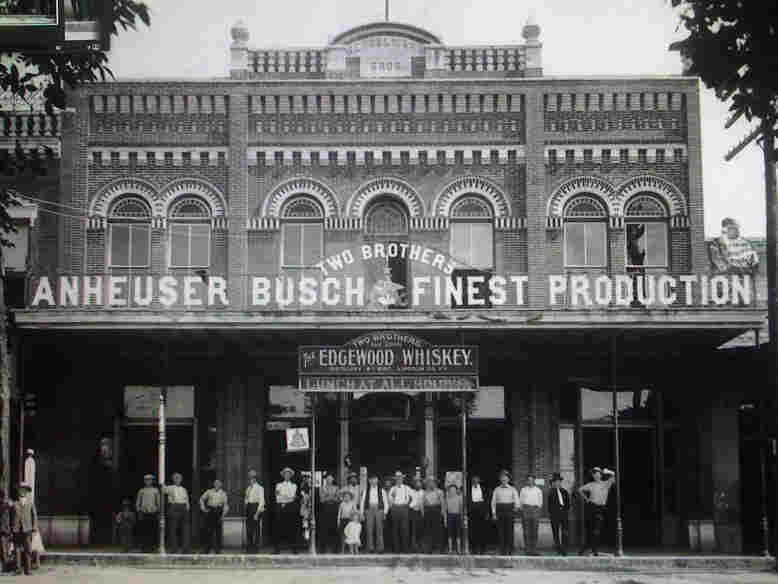 When Harper began the project, most people in town remembered the ornate red-brick building only as a Western Auto store. "When I would meet locals down at Frank's Restaurant or different cafes, they'd ask me what I was doing, and I'd say, 'Well, I'm restoring the old dance hall downtown.' And they'd say, 'What dance hall downtown?' " Harper says. Dance hall builders were chiefly Czechs and Germans who migrated to Texas from the 1830s through the end of the 19th century, looking for freedom and cheap farmland. Harper's wife, Hana Hillerova, happens to be from the Czech Republic, and when she arrived in Texas ,she recognized her own dance hall tradition. "I grew up in Prague, but we would always go to the dance halls in the country that were built by benevolent societies of citizens who wanted to get together and play music and drink beer. And it's still the same here," she says. Moravians and Alsatians, Hessians and Wends stepped onto the wharves at Galveston, spreading out across the Blackland Prairie and into the juniper-covered hills to the west. They built tall-steepled churches and brought with them their love of polkas and dancing and beer. "You would have, in the Hill Country, a German hall, an Alsatian hall and then two or three Czech halls. And so that'll be five places in one little community of maybe 750 people," says John Spong, senior editor of Texas Monthly magazine, who wrote a recent cover story on dance halls. Over time, the Europeans assimilated into Texans. Migration to the cities depopulated many small towns. And the cavernous wooden party barns were hard to keep up. 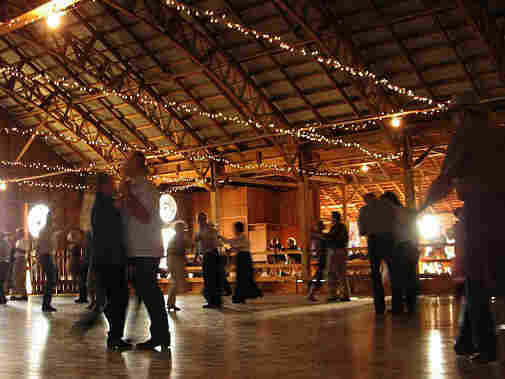 Today the dance halls are state treasures — the few that are still operating, like Gruene Hall, Anhalt Hall, Luckenbach Dance Hall, and the Quihi Gun Club and Dance Hall. The reopening of Sengelmann Hall last summer has revitalized downtown Schulenburg, formerly known for its drive-through liquor store and gun shop under one roof. "Our heritage here in the small towns, especially the Schulenburg area, is that we grew up in dance halls," says Leo Kopecky [pronounced Ka-PIN-sky], a former mayor and downtown bar owner. "There was nothing else to do when we were kids back in the early '50s and '60s. It's a revival, really, of an era past. And I think it's a wonderful thing for Schulenburg."